Directed by Michel Ocelot, 2011. Animated. 84 min. A hit at the 2011 Berlin Film Festival, Tales of the Night follows three young writers who meet in an abandoned cinema to create six fairytales. Travel with them as their imaginations take them to exotic lands. Explore the Library’s kids’ collection and enjoy story time and arts and crafts in French from 3:30–4:15pm. Back by popular demand, Goat on a Boat presents a puppet show that combines three classic European fairytales into a unique, funny adventure. Told in French and performed in English by Liz Joyce. Celebrate the holidays with some dancing! Parents and kids are invited to groove to the French beats of NY-based DJ Dima Dubson. Discover unique children's books in French for all ages and levels. Buy the perfect holiday gift for the young Francophiles in your life! Every Friday and Saturday night 9.30-11.30pm, Jacques and Marie will be singing French classic hits by Trenet, Piaf, Montand, Dassin, Aznavour as well as New Orleans swing standards and originals at Gaby, the restaurant of the Sofitel. Jacques & Marie have performed extensively in Europe and the United States in concert and on national radio and television. Their twelve-year partnership has grown substantially since its inception, from cabaret duo to 12-piece orchestra, performing for tots, teens and adults. Where to taste sweet delis from France, buy cute French clothes or books, and meet French people in a fun environment ? The Lycée Francais de New York is opening its doors to the public this week-end for its 2012 Fall Festival. Spread between Friday evening, November 9th and Saturday, November 10th, participants will enjoy various tastings of cocktails, high end chefs, a book fair, a vendors’ fair as well as many fun activities for children. Adults only. $40 in advance, $50 at the door. Ticket price includes food tasting and open bar. Home décor: Annabelle’s Pottery, Theoreme/Agnes de Villarson, Pia Rossi, Lee Baratier, Gregoire Ganter Photography, Adventure Shop, Craftspring, Retro NY Metro Inc. The Fall Festival vendor list wouldn’t be complete without the French Book Fair. This popular booth features new books for both adults and children including pictures books, atlases, novels, comic books, first readers, and many more. 100% of the proceeds from the sale of the books go directly to the Lycée Français. Finally, children will be entertained with a variety of activities and classes for kids of all ages including: music classes, basketball, dance, soccer, yoga, story time, djembe, Brazilian bracelet making and many more. For the second year, WantedDesign is opening its doors during the ICCF week in Manhattan in the beautiful landmark building, Terminal Stores /The Tunnel, on 11th Avenue and 28th Street. Created by Odile Hainaut and Claire Pijoulat, WantedDesign is the central point of exchange for the international design community during the New York design Week. Booths, panels, events and workshops bring together international designers, architects, interior designers, craftsmen, curators,...in a very convivial and interactive atmosphere. "Its format reflects what New York is: multicultural, convivial, provocative, contrasted, innovative, full of energy and talent". 2012 WantedDesign is presenting Belgium's Tamawa, who is using bakelite spheres as a single material to create colorful products from home accessories to watches and jewelry. From New Zealand, David Trubridge will showcase his latest design, from Giant pieces to his outdoor collection and all-new Mini-Grow range of radically scaled-down kitset light, continuing to push design boundaries while maintaining a commitment to sustainability and minimizing environmental impact. Creativity and design research from Latin America will be presented by Heidi Jalkh, a Colombian designer based in Argentina, and Mexico-based Adan Carades, who will reveal his latest chairs and rug designs. French silver company Christofle, a symbol of luxury and refinement, will present a preview of their upcoming NYC new flagship within a 300-square-foot display at WantedDesign. The display, created by Stéphane Parmentier, will feature several design elements from the flagship store. The Meisenthal International Glass Art Centre / CIAV will exhibit for the first time in the US some recent collaborations with designers experimenting in new glass possibilites. Also will be featured the French, up and coming designers Ionna Vautrin, Pierre Favresse, POOL, NOCC, A+A Cooren in the exhibit Nouvelle Vague, curated by Cedric Morisset as well as recent graduates from ECAL Romain Lagrange or Olivier Dolle, who combines traditional craft and contemporary design for his collection of wood furniture. Nicole Renaud blends her classical training and accordeon skills to create an "otherworldly" universe. She sings, writes, sets poems to music, designs her own costumes, composes film soundtrack, all in one for her own very original music. this french intimate bistro hideway is a vignette of the artsy "old chelsea". great food & warm hospitality. a cafe straight of a caro & jeunet film! Some may say New York City lacks the necessary Francophile accoutrements to be considered Parisian. Instead of rues there are avenues, geometric high rises dominate the skyline, and there’s the constant hustle and bustle paired with the hum of subway trains rumbling below. But as a cosmopolitan metropolis, New York City is so diverse that just about anyone from anywhere could rediscover the idiosyncrasies of home and construct their own cultural enclave around them. Delecourt used to take periodic trips to France and return to New York with suitcases full of her favorite products, but she has since explored every nook and cranny of Manhattan to find them here, documenting the pursuit on her blog. Bon appetit! It’s easy to eat like a Parisian in New York: Sip on brut cuvée or sparkling rosé at Flute Bar and Lounge, grab a fresh baguette at Francois Payard Bakery, or for a wide selection of low-priced fromage visit East Village Cheese. Don’t forget about the myriad of French eateries throughout the city—Epicerie Café Charbon, L’École Restaurant at the French Culinary Institute, and Balthazar to name a few. Trés Beaux-Arts: Amidst New York’s brick-faced, English-style buildings you’ll find grand façades rooted in French Beaux-Arts. Characterized by grandiose pavilions, tall parapets and columns, classical detailing, and arched windows, many of the Beaux-Arts style buildings were constructed by American architects who trained at L’Ecole des Beaux-Arts in Paris from the 1890s until the First World War. Marvel at the New York Public Library, Grand Central Terminal, and the Metropolitan Museum of Art or visit the Beaux Arts Alliances for lectures and walking tours of the city that highlight this architectural movement. French cinema: Take a free cinematic tour of France en plein air by catching a French summertime film screening in New York City parks during the Films on the Green series, co-organized by the Cultural Services of the French Embassy. Walk like a Parisian: Meander the cobblestone streets of 9th Avenue in Chelsea and dine at Pastis French Bistro. Then, peruse Chelsea’s High Line, which is similar to the Promenade Plantée in Paris. Both structures are tree-lined parkways built on former railway lines that run across rooftops in the city. French indulgences: Spoil yourself with macaroons and hazelnut mousse at Francois Chocolate Bar, located on the fourth floor of Mauboussin, a Parisian jewelry boutique. Then, pop into the nearby French Institute Alliance Française and browse their list of French cultural activities or head over to The Paris Theatre to catch a French film. Picnic in the park: Grab a crepe Suzette to go from Creperie NYC in the West Village then enjoy it under the Washington Square Park arch, which echoes the tunes of street musicians. New York architect Stanford White modeled the arch after the Arc de Triomphe. Megan Snedden is a California-born writer and adventurer who currently lives in New York City. Connect with her on twitter @megansnedden. "When I spent five months living in Paris in 2000, I fell in love – with loose, fluffy omelettes stuffed with gruyère; creamy pâté slathered on crispy baguettes; and pillowy, sweet pains au lait that I picked up each morning at the pâtisserie on my way to class. After my return stateside, I made it my mission to find solid approximations of these and my many other edible French amours, and though it took some hunting – I tried many a leaden croissant – New York City ultimately supplied my fix. Even better, la Grande Pomme knows no closing times; the City of Light is available any time of day in the city that never sleeps. Here's a 24-hour guide to eating French in New York. Tucked away on a West Village side street, the humble Café Henri (27 Bedford St.; 212/243-2846), with its bright blue door and handful of tiny tables, is the perfect place for a simple French lunch. Try the classicjambon-beurre sandwich (ham and butter on a crispy baguette with a side of cornichons) or choose from one of the lacey and light crêpes salées. Café Henri's omelettes are also up to exacting French standards, slightly loose and velvety soft. Murray's Cheese Shop (254 Bleecker St.; 212/243-3289) offers an impressive array of French fromage, likePersillé du Beaujolais, a sweet cow's milk blue or the preferes des montagnes, a creamy, aromatic approximation of the beloved raw milk reblochon, which is no longer legal to sell in the U.S.
Before opening Le Dû's Wines (600 Washington St.; 212/924-6999), Jean Luc Le Dû was the long-time sommelier at the renowned restaurant Daniel. Though Le Dû's sells wines from around the world, the selection of French bottles, representing each of the nation's growing regions, is extraordinary, ranging from very fine $10 bottles to pricey, extremely rare vintages. Thé Adoré (17 E 13th Street, 212-243-8742), a rustically cozy snip of a place just off of Union Square, is a French-style tearoom with an Eastern twist. The tea menu features a wide selection of Mariage Frères blends alongside Japanese favorites like Hoji-cha and Sen-cha. Relax with a cup and a plate of light, spongy madeleines. The pastry cases at Chelsea patisserie La Bergamote (177 9th Ave.; 212/627-9010) are lined with fine versions of French favorites like moist fruit-filled financiers, delicate meringues, and range of gorgeous gateaux. But the real stunners are the gleaming glazed fruit tarts, sweet and fresh-tasting on top of their buttery pastry base. Head uptown to the base of the legendary Seagram Building, the sleek, ultra-modern Brasserie (100 E. 53rd St.; 212/751-4840), is the pinnacle of New York urbanity with a side of French flair. Sip a traditional kir royale or the -8˚ Martini (Ciroc vodka, 8 Brix verjus, frozen muscat grapes) and snack on gougères or a mini croque-monsieur. DBGB (299 Bowery; 212/933-5300), the newest and most casual of Daniel Boulud's New York eateries, updates the classic brasserie with a little downtown edge. Resist the temptation of the menu's hearty French favorites (including a sublime fromage de tête, the same as the famous version served at the restaurant's uptown siblingBar Boulud), and focus instead on the stars of the show: sausages and burgers. Start by sharing a few links among the table—"Parisiennes," small, tight veal sausages that pop with smooth meaty flavor, or the succulent "Viennoise," a joyfully messy version of the Austrian kaiserkrainer, stuffed with emmenthaler and served with tangy housemade sauerkraut. The Frenchie burger, with confit pork belly and Morbier cheese on a brioche bun, injects Continental flavors into the American classic. With a wine list practically bigger than the bar itself, the intimate Blue Ribbon Downing Street Bar (34 Downing St.; 212/691-0404) is a cozy after-dinner retreat. Split a bottle or try one of the tasty cocktails like Provençal Punch (Pastis, lime juice and soda) or White Oak, which combines Surrenne cognac with maraschino liqueur, triple sec, and lime juice. Snag a burgundy leather stool and pull up to the long zinc bar at Balthazar (80 Spring St.; 212/965-1785), Soho's ever-popular, always bustling bistro stalwart. Brass mirrors lining the wall are the perfect tool for spying on a crowd of locals, tourists, and the odd boldface name as you sip wine by the glass or splurge on a bottle from the pricey but well-maintained reserve list. For a petit snack, try the justly famous steak tartare or a goat cheese tarte. To keep l'esprit de France going into the wee hours, stop by Flute (40 East 20th St.; 212/529-7870), whose impressive menu of bubblies is anchored by a strong Champagne list, available by the flute, flight, bottle, or in mixed drinks. In the wee hours, hop across the street from Flute to L'Express (249 Park Ave. South; 212/254-5858), a textbook-perfect French bistro experience merged with a 24-hour diner. The moules frites are the star of the show, garlicky and briny, perfect washed down with a bracing espresso to power you through until the sun comes up. To assure that you get them at their freshest (and before they've run out), hit these downtown bakeries as the sun rises over Manhattan. Start your tour with Ceci Cela's (55 Spring St.; 212/274-9179) classic version, a perfect French specimen with a flaky outer crust and diaphanous, buttery interior (note that they open at 7 a.m., but they'll be in there baking if you show up earlier). A few blocks away, Francois Payard Bakery (116 W. Houston St.; 212/995-0888), has crisp croissants aux amandes studded with almonds and powdered sugar and filled with a velvety almond cream. Patisserie Claude (187 W. 4th Street, 212-255-5911) doesn't open until 8AM, but it's worth the wait for a taste of the bakery's luscious pain au chocolat fresh from the oven. Rest your pieds and recharge for the day at Café Cluny (284 W. 12th St.; 212/255-6900), another of the West Village's picture-perfect Parisian transplants. Start with a grapefruit brulée or mixed berries with cream, and move on to an omelette aux fines herbes and a café au lait — or two. Famed chocolatier Michel Cluizel has been making chocolate in France since 1948. At his New York outpostMichel Cluizel Chocolate (584 Fifth Ave.; 646/415-9126), indulge in his intensely rich, silky single-source bars (the darkest of which are 99% cacao), springy, crackly chocolate macarons, and for les enfants, milk chocolate lollipops with hazelnut praline. The grand-père of New York French restaurants, La Grenouille (3 East 52nd St.; 212/7521495) has epitomized classic haute cuisine since opening in 1962. Though dinner in the opulent dining room can run well into the three figures, two- and three-course lunches are comparatively affordable, and offer the chance to try the delicate sautéed frog legs or the earthy, sweet calf's liver with dates and raisins. No matter what your entrée, end the meal with one of La Grenouille's impossibly airy soufflés. At this French-owned modern hotel, you're greeted with "bonjour" or "bonsoir" before being escorted to the chicly appointed rooms, which are sizeable for Manhattan standards and stocked with Bose iPod docks, marble baths, and L'Occitane toiletries. The convenient midtown location makes the Sofitel parfait for exploring the city's French wonders." Films On the Green presents six movies inspired by French musicals or adaptation of an Opera in the parks throughout NYC. Those free screenings are organized by the Cultural Services of the French Embassy and the NYC Department of Parks and Recreation. The Young Girls of Rochefort is a classic of French cinema starring Gene Kelly and George Chakiris (of West Side Story fame) opposite Catherine Deneuve and Françoise Dorléac. The film’s score, by Michel Legrand, was nominated for an Oscar in 1969. A dark musical comedy, 8 Women boasts a first-rate cast of many of France’s finest female actresses, including Catherine Deneuve, Isabelle Huppert, and Emmanuelle Béart. This over-the-top parody of murder mysteries was nominated for 12 Césars in 2003. Same Old Songsfeatures an interesting twist: the actors lip-synch to songs performed by the original artists, making for unusual juxtapositions (of a female character singing in a male voice, for instance). The movie won Best Film at the 1998 César Awards. One of Jean-Luc Godard’s first movies, and undoubtedly one of his most playful, A Woman is a Woman is a tender tribute to childishness and to American musicals—but with a distinct New Wave flair! Love Songs , about youths coping with the loss of a loved one, also parts ways with tradition: its use of the romantic and comedic elements of the musical contrasts with its serious storyline. To cap it all off in style, the series will end with Tosca: the Movie . Tosca is not an opera performance captured on film, but rather the opera adapted for film, starring celebrated opera singers Angela Gheorghiu and Roberto Alagna. It is a must-see for both opera aficionados and novices. Directed by Jacques Perrin & Jacques Cluzaud.100minutes.France/Switzerland/Spain/Monaco, Disneynature, 2009. Disneynature, the studio that presented last year’s record-breaking film Earth, brings Oceans to the big screen on Earth Day, 2010. Featuring spectacular, never-before-seen imagery captured by the latest underwater technologies, Oceans offers an unprecedented look beneath the sea in this powerful yet enchanting motion picture. Two-time Academy Award nominee Jacques Perrin and César nominee Jacques Cluzaud dive deep into the very waters that sustain all of mankind and cover nearly three quarters of the earth’s surface, exploring the playful splendor and the hard reality of the weird and wonderful creatures that live within. Theatre premiere on Thursday, April 22nd! For showtimes and tickets, click here. Directed by Jacques Audiard, 150 minutes, France/Italy, Sony Pictures Classics, 2009. With Tahar Rahim, Niels Arestrup, Adel Bencherif. Winner of the Grand Jury Prize at Cannes and Oscar nominee for Best Foreign Language Film, this exhilarating crime epic from director Jacques Audiard follows an illiterate French-Arab prison inmate’s six-year odyssey from new kid on the cell block to underworld kingpin. Along the way, Malik (remarkable newcomer Tahar Rahim) learns how to read not just books but people, too, as the protégé of a brutal Corsican gang leader (the electrifying Niels Arestrup), until the pupil threatens to overtake the master, playing every one of Paris’ rival gangland factions to his own advantage. Directed by Tomm Moore, 75 minutes, Ireland/France/Belgium, Gkids, 2009. The Secret of Kellshas also been nominated for the Academy Award for Best Animated Film. All over town, you can taste the famous macarons, those delicate round pastries with a crunchy outside and soft inside. Francois Payard is organizing the first annual Macaron Day in NYC, which correspond with the 5th annual Jour du Macaron in Paris, created by Pierre Herme, one of the famous parisian Patisserie. A portion of the sales will be donated to City Harvest. with Q & A with actor Vincent Perez and director Denis Dercourt. Juliette Binoche...everywhere in New York this month ! She will be dancing, exhibiting paintings, releasing a book and more. Many events will offer the american public an unique opportunity to discover a new facet of this multi-talented artist. If you are nostalgic of Paris, don't miss the opening of the last movie from Cedric Klaplisch, "Paris", a kaleidoscopic letter to the City of Lights and its inhabitants, on Friday at the IFC Center. From 09/10 to 10/09, 58 of her ink-wash portraits of herself and her co-stars of various films and poems will be on display at the Cultural Services of the French Embassy at 972 5th Avenue. Admission Free. From 1pm to 6pm. From September 15 to September 26, she will be performing with Akram Khan a contemporary piece for two "In-l & Jubilations" at the BAM. Artist talk tonight. And BAMCinematek will present Rendez-Vous With Juliette Binoche, a 14-film retrospective. There are two places in New York where you can hear speaking French while walking in the streets. Fun place to meet friends for diner. Authentic French vibe with the decor and the crowd. Outdoor dining. LES's newest underground secret spot. A mix of a Parisian grocery store and a bar Tabac. Nice spot for Brunch. Kind of like a bodega mixing French, African and Moroccan food. Fun atmosphere. Great cocktails. French provincial upscale dining. Murano-glass chandeliers dangling over a central communal table made for large groups or smaller parties. Private dining-room in the back. Bar with few banquettes and lounge area downstairs. For the atmosphere and characters that you will meet over there. Boho crowd. High ceiling with love letters scrawled on the wall. Food with ups and down. Cafe Litteraire et Cine Club : Screening, readings and cultural event. Supposed to be like a French Truck stop with good and cheap food. Tasty French sandwiches served on crusty baguettes, steak Hache but also Moules Marinieres, Cassoulet and Tuna a la Provencale. A cocktail louge and upscale French- African/Asian fusion restaurant. For savory and sweet crepes of course. Watch top players from around the world as well as Brooklyn locals fight it out in the largest Petanque Tournament in the US. Drink the famous Ricard and eat Merguez and Frites like the local petangue guy from Marseille. This has nothing to do with Parisian or French habits, but I found the idea pretty convenient for an improvised Picnic this week-end. Place order with Slice (212-249-4353 or sliceperfect.com), then meet delivery guys at 72nd St., at Fifth Ave., or at Sheep’s Meadow, 66th-69th Sts., near beach volleyball court entrance. This week-end, enjoy a tour in one of the most inspiring neighborhoods of Manhattan. 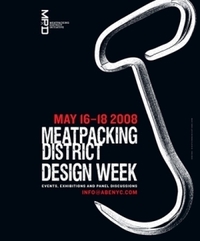 Design Week events typically include afternoon and evening exhibitions, product launches, panel discussions, art installations, and cocktail parties, all held in venues, stores, and restaurants around the Meatpacking District. The showcase happens every spring and is timed to coincide with the International Contemporary Furniture Fair. If it is raining, stop by one of those numerous French bistros. I would recommend a morning Croissant at Pastis, or a late lunch with Tapenade Crostini and Tarte aux Pommes at Fig and Olive (a Mediterranean kitchen and olive oil tasting bar), or an evening Martini at Buddha Bar (sister to Buddha Bar Paris and a nightlife mecca for celebrities).